A leopard was put down after it attacked a tour guide in the Kruger National Park on Thursday, SANParks said. The guide and about six tourists were in an open safari vehicle watching the leopard, which was about 2m away, on the H4-1 road near the Skukuza camp around 13:00, spokesperson William Mabasa said in a statement. Mabasa said the animal "cunningly disappeared" and snuck around to the driver’s side of the vehicle and attacked the guide. The Lowvelder online named him as Curtis Plumb, 38. "Suddenly the leopard leapt and grabbed his arm, trying to jump into the vehicle," Mabasa said. "Everybody in the vehicle started hitting the leopard with any object they had with them. 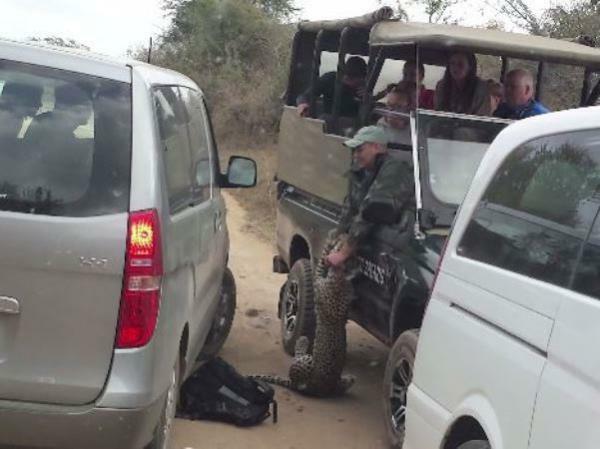 The leopard would not let go of the guide’s arm; until a tourist from another vehicle rushed and repeatedly used his vehicle to scare off the animal and that is when it eventually let go." Mabasa said it was badly injured and had to be put down. "In the scuffle, when it eventually fell down, the guide was trying to reverse his vehicle and it fell under the wheel. On its own it was injured, probably from fighting with another leopard." "There was no way we could leave it to suffer." The Lowvelder quoted Lifemed paramedic Gerty Greyling as saying: "It’s difficult to elaborate on the extent of his injuries. The wound will most likely be cleaned in theatre and only then will one see how deep the lacerations are."